Vodacom is the leader of the mobile communications sector in the Democratic Republic of the Congo. It owns the bulk of the country's subscriber base - about 12.8 million subscribers use the services of that operator. 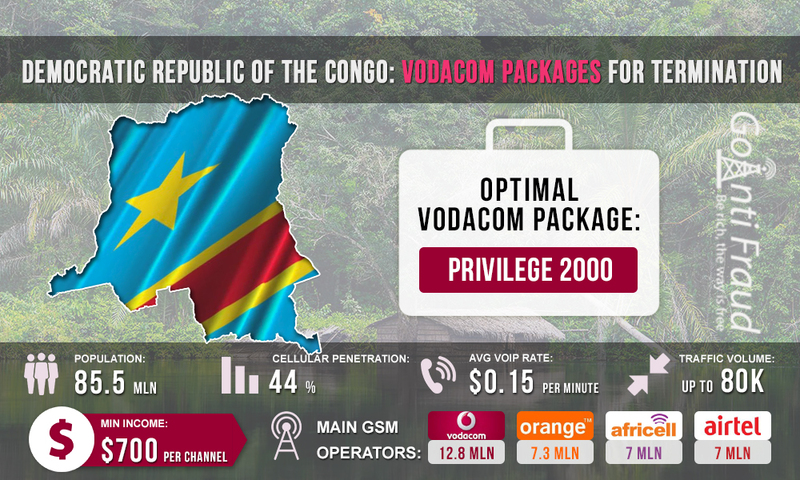 Vodacom GSM coverage spans 50% of the territory of the Democratic Republic of Congo. Provided that you choose the right prepaid package from Vodacom, you will earn good money on VoIP GSM termination. JS8 PACK. Includes several tariff plans: 20 U: unlimited calls within the network from 00.00 am until 04.59 am; cost — $0.01. 300U: 45 minutes for calls within the network, duration - 7 days cost — $0.19. 500U: 50 minutes for calls to numbers of any operators, duration - 24 hours, cost — $0.3. PRIVILEGE. There are several packages: 500U: 70 minutes for calls within the network, cost — $0.3. 2000U: 300 minutes for calls within the network, cost — $1.28. The PRIVILEGE 2000U package will be the most appropriate choice for the operation of SIM cards. With this package, the price per minute of a call will be about $0.004. It is unlikely that you will have time to use all the minutes before blocking, so let's calculate approximate income, provided that the number of minutes terminated per day will be 100. With high mobile voip call rates in south africa, you will be able to get a profit of $250 from a VoIP equipment channel. The more international minutes you land at local rates, the higher your income will be. It is also important to take care of competent bypassing of antifraud-systems.